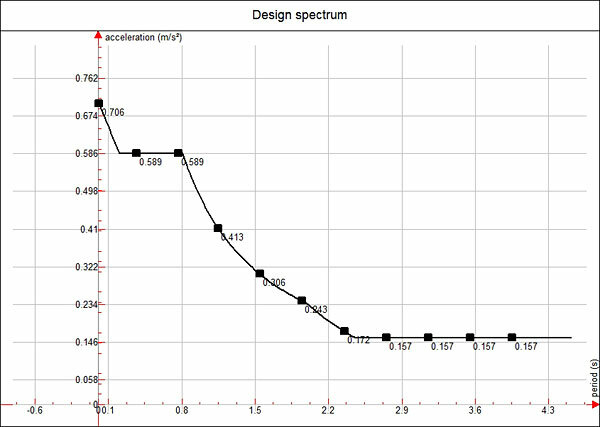 How is a seismic calculation performed using an elastic spectrum or a design spectrum? Linear-elastic analysis of the structures can be performed by using one of the two methods mentioned in Eurocode 8 (EN 1998-1-1): lateral force method of analysis or modal response spectrum analysis. These methods depend on the structural characteristics of the analyzed building. 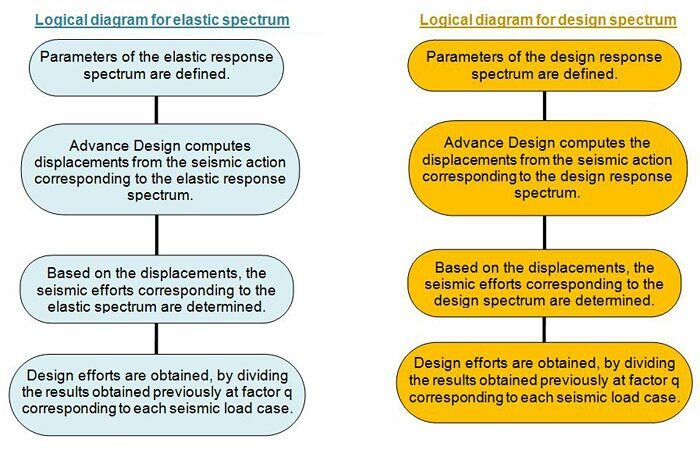 Advance Design can generate seismic action using an elastic response spectrum or a design response spectrum. 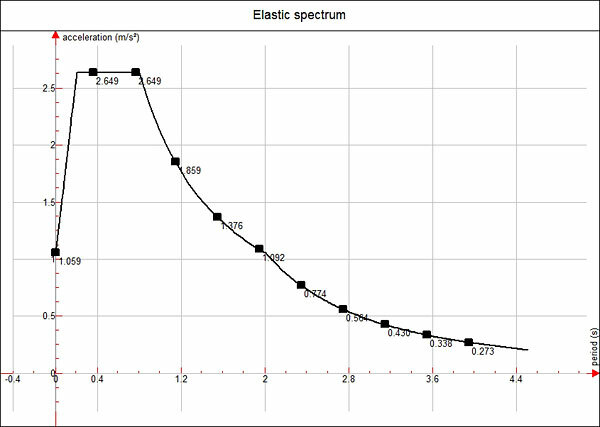 Parameters corresponding to the seism family (agr/g ; ground type, TB, TC, TD, q), for both the elastic response spectrum and the design response spectrum can be defined in the properties window (see the following figures). For the elastic spectrum, by default, the behavior factor is "1.0" for all components of the seismic action. For the design spectrum, the default value for the behavior factor is "1.0" for horizontal components and "1.5" for vertical component of the seismic action. 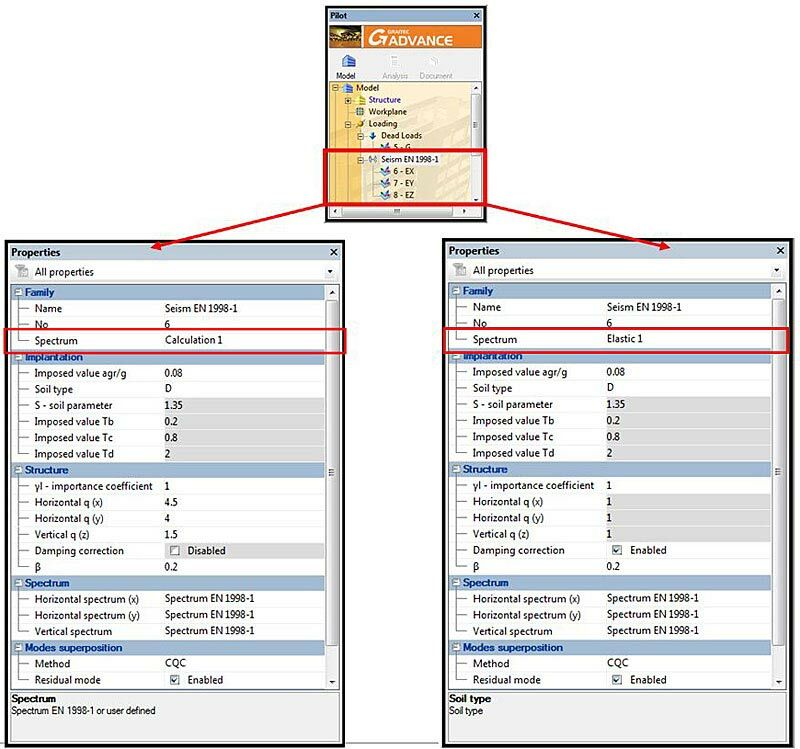 The user can set other values according to the type of structural system and its regularity in elevation (see EN 1998-1, chapter 5.2.2.2 Behavior factors for horizontal seismic actions). To set different behavior factors corresponding to the main directions of seismic action (X, Y, Z), they can be defined separately for each seismic load case (this is possible only for the elastic response spectrum, see Figure 3). 1. To calculate the displacements corresponding to the design response spectrum, Advance Design will use for the behavior factor the values defined in the properties of the seism family. 2. To calculate the displacements corresponding to the elastic response spectrum, Advance Design will use a behavior factor equal to 1.0 (see Figure 4). 3. When using a design spectrum, the design efforts shall be determined using a behavior factor equal to "1.0". Design efforts are computed based on the design spectrum which already contains the behavior factor corresponding to the analyzed case. 4. To define the parameters of a modal analysis refer to the FAQ: "How are modal analysis hypotheses defined?". 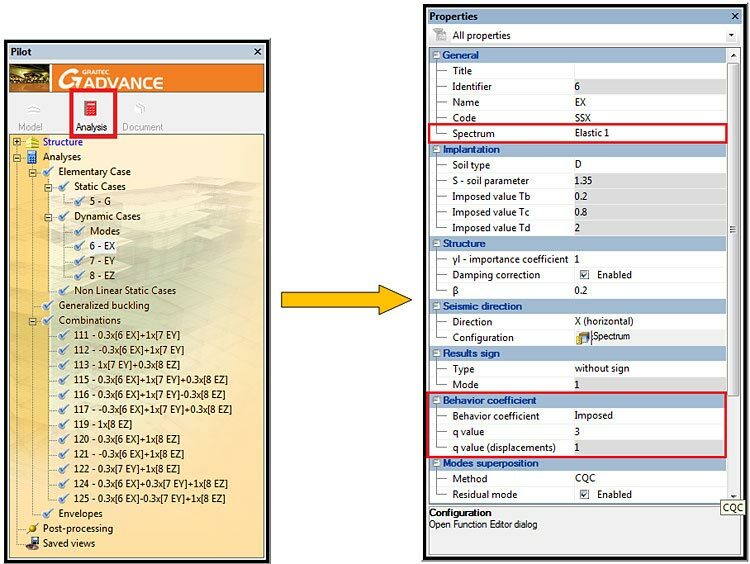 In analysis mode, by selecting any seismic load case, Advance Design will show information regarding the behavior factors used to determine seismic response (see Figure 4, for a load case corresponding to an elastic spectrum, and Figure 5, for a load case corresponding to a design spectrum).